Background: Cytological examination of pericardial effusion fluids is important in diagnosing the etiology of underlying disease, staging, and prognosis of cancer. Aims and Objectives: (1) To study cytological evaluation of pericardial effusions in various pathological conditions in a tertiary care center. (2) To analyze their frequency and clincopathological correlation of the diagnosis. Materials and Methods: Our study was a retrospective study performed in the Department of Pathology from 1st January 2012 to 31st December 2016. The study sample included all the pericardial effusions submitted in the pathology department for cytological evaluation. Clinical details and relevant parameters correlated with clinical findings. Each fluid underwent cytospin and cytocentrifuge along with preparation of conventional smears. Results: Of 120 cases, 80% were of benign effusion and 20% were of malignant effusion. Male-to-female ratio was 1.44:1 with patient age ranging from 3 to 90 years. Conclusion: Benign effusions can been seen in younger age group and malignant ones in the older age group. The preliminary pericardial fluid analysis in resource-limited settings is the most convenient and cost-effective method for accurate diagnosis. It reduces the demand of invasive investigations and its complications. At times, it is the first test to point toward underlying malignant process thereby affecting the prognosis, survival, and treatment outcome of the patient. Cytological analyses of pericardial effusions play an important role in the diagnosis of causative disease. It has a great significant contribution in cancer research and staging of various tumors. The pericardial effusion prevalence in hospitalized patients in the tertiary care center is only 0.1%. Differential diagnosis of pericardial effusion is malignancy, idiopathic pericarditis, infective, radiation pericarditis, drug-induced, hypothyroidism, and other autoimmune disorders. In this study, we analyze the data and evaluate the benefits and various limitations of cytological examination of pericardial fluid in establishing the clinical diagnosis. This study was retrospective, performed on the pericardial fluid sample submitted to the Department of Pathology from January 2012 to December 2016. The complete clinical along with the gross and microscopic profile of the pericardial fluid was corroborated. The samples of serous effusions were stored in sterile adequate size containers with the requisition forms. In cases of delay in sample processing, the sample storage temperature was kept at 2°–6°C. The fluid received in the laboratory underwent gross examination and cytocentrifugation at 3000 revolutions/min for 5 min. The supernatant fluid was discarded. The slides were made from sediment by transferring it on to two glass slides with the help of pipette and spread evenly. One was air-dried and stained with Giemsa stain. The fluids underwent special stains, immunocytochemistry, and flow cytometry application when required. The criteria used to diagnose benign and malignant were similar to those used in routine cytology reporting. The results of cytological examination of the pericardial fluid correlated with clinical and laboratory data. This study was exempt from approval as it was a retrospective study. The cases under study were already submitted. A total of 120 fluid samples of pericardial fluid were submitted for cytological examination analyzed. Of 120 cases, 60% (71) were men and 40% (49) were women patients with the male-to-female ratio of 1.44:1. The age of the patients ranged from 3 to 92 years with a mean age of 46.39 ± 7.34 years. The maximum numbers of patients were between 51 and 60 years (25.8%). The mean age of malignant pericardial effusion was 49.1 ± 14.6 years and of benign was 44.5 ± 18.1 years. 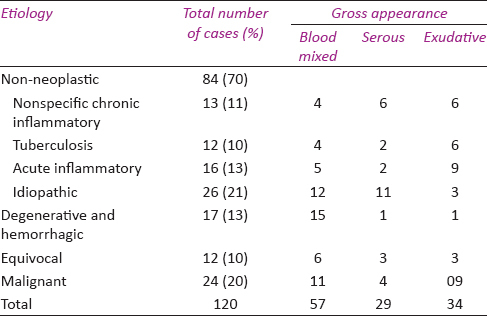 The gross appearance of 47% (57) of samples was blood mixed, while 9 were frankly hemorrhagic, 24% were serous, and 28.3% were exudative [Table 1]. In 70% of cases, the suspected clinical diagnosis was either malignancy or inflammation, or both. Tubercular was kept as differential diagnosis in the 40% of the cases. Concomitant pleural effusion was noted in 30% of cases. Five patients had chronic renal disease and were on dialysis. On cytological analysis, a majority of the specimens, 70% (84), were benign (infective/reactive) and negative for malignancy [Table 2]. About 10% were equivocal, while 20% (24) of cases were malignant. The diagnosis was acute inflammatory in 13% of cases [Figure 1]A. The diagnosis was reactive in 21% (26) of cases and chronic inflammatory in 21% (25) of cases [Figure 1]B. Tuberculosis was diagnosed in 10% of cases [Figure 1]C. About 7% (9) of the sample were frankly hemorrhagic, and no diagnosis could be made. About 6% (8) of sample showed degenerative changes, due to delay in sample submission or processing. About 21% of cases were chronic inflammatory, of which 10% were tubercular effusion. Of the remaining 11% (13) of cases, one patient had chronic renal failure and two patients had underlying connective tissue disorder. The tubercular lesion showed epithelioid cells, lymphocytes, and reactive mesothelial cells in sheets and clusters with vague granuloma in two cases [Figure 1]c. AFB stain was positive in two cases. Diagnosis of reactive was given in 26 (21%) of cases. The microscopic finding showed reactive mesothelial cells with clear gap or window in between them. In four cases, the reactive mesothelial cells showed mild atypia. The delay in fluid processing leads to further artefacts. Malignancy included were 20% (24) of all the cases. Of the total 24 cases, 4 cases were known cases of breast carcinoma while 3 cases had lung carcinoma, 2 patients had GIT (Gastrointestinal tract) malignancy, and 2 patients had lymphoma. About 40% of the patients had unknown malignancy. Five patients had distant metastasis. Both the lymphoma effusions underwent immunocytochemistry application. Six patients had concurrent malignant pleural effusion. Five cases had immunocytochemistry evaluation. Most of the malignant effusions in the specimen were grossly blood-stained or exudative. About 16% cases had serous effusion. Of 24 patients, histopathology was available for 20 patients which confirmed malignancy. The most common type was adenocarcinoma. Breast carcinomas cells were medium or large forming glandular structures. 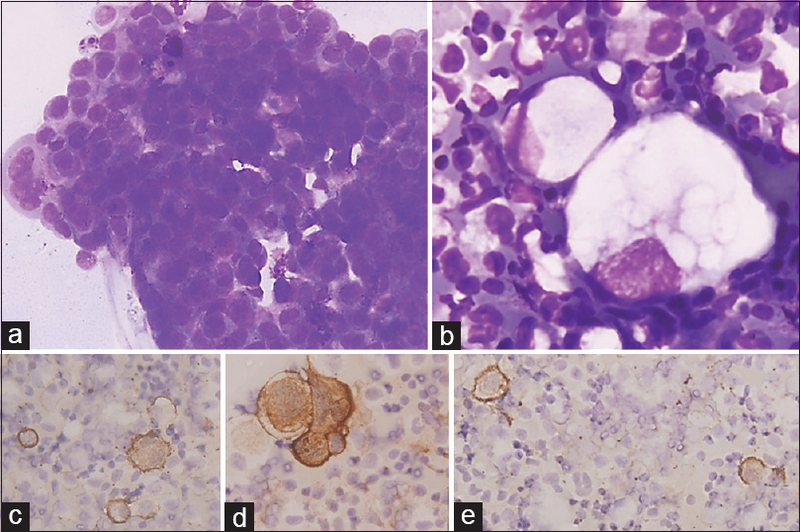 Metastatic ovarian carcinomas also showed adenocarcinoma morphology [Figure 2]a and [Figure 2]b. ICC (Immunocytochemistry) used for adenocarcinoma and mesothelioma was CK, MOC-31, CEA, EMA and calretinin, CK5/6, and mesothelin [Figure 2]c,[Figure 2]d,[Figure 2]e. Lymphoma cells scatter singly and have spherical to oval nuclei with irregular nuclear contour and nuclear indentation with prominent nucleoli and scant cytoplasm. Of two lymphoma cases, one was B-cell and the other was T-cell lymphoma, diagnosed on immunocytochemistry [Figure 3]a,[Figure 3]b,[Figure 3]c,[Figure 3]d.
The equivocal cases account for 10% of the total. In equivocal cases, confirmatory diagnosis was not made due to low cellularity and degenerative changes. Histology was available for only five equivocal cases (two breast carcinoma, one lung carcinoma, one gut carcinoma, and one case of ovarian carcinoma). In this study, the overall sensitivity of pericardial fluid cytology was 72%. The pericardial effusion examination is challenging as the cells are distributed in a larger surface area than those in fine needle aspiration cytology. The material obtained by pericardial effusion aspirated is representative of a large surface area than that obtained by pericardial biopsy. Correct identification of reactive mesothelial cells might be challenging as they may mimic the malignant cell. In this study, 5-year data of pericardial fluid cytology of a tertiary care center in North India were evaluated to know its significance in the diagnosis of various non-neoplastic and neoplastic conditions. In this study, there is a slight male preponderance (1.4:1), similar to the study done by Hathila et al. The pericardial effusion was blood-stained in 60% of cases; it was similar to the study by Petcu et al. In our study, the most common finding was reactive mesothelial cells and features of chronic inflammation in 21% of cases each; similar to the study by Petcu et al. where they found idiopathic pericardial effusion in 25.9% of cases. Reactive change in mesothelial cells is seen in many benign conditions – rheumatic pericarditis or post-MI (Myocardial infarction) pericarditis, systemic disease (collagen vascular diseases), cirrhosis, radiation, underlying neoplasm, chronic inflammation, foreign substances, and infections. A lot of pericardial effusions occur due to viral etiology. Pericardial effusion due to viral etiology does not have specific cytological diagnostic features. The clinical features of tubercular and nontubercular pericardial effusion were similar. It is important to diagnose tubercular pericardial effusion as without specific treatment the mortality rate is high. In this study, 12 cases had tubercular effusion, of which only four cases were AFB stain positive. Two cases of tubercular effusion were known cases of HIV. In a study by Cheema et al., there was 100% association between tuberculosis and HIV. Malignant pericardial effusion was seen in 20% of cases. In various studies, the rate of malignant pericardial effusion is 20%–21%. Cardiac tamponade is the first manifestation of malignancy in many studies, similar to our study., Dragoescu and Liu et al. found that pericardial fluid cytology has better diagnostic value in detecting malignancy than pericardial biopsy. The reported sensitivity and specificity of pericardial effusion cytology were 71% and 100%, when compared with 64% sensitivity and 85% specificity of the pericardial biopsy. The mean age of malignant pericardial effusion in this study was 49 ± 14 years. Pericardial fluid cytology has diagnostic accuracy of 80%–90% for malignant etiology. Accurate identification of malignant cell helps in diagnosing the site of origin. Cell block preparation by embedding the sediment material into paraffin and then immunohistochemistry aids in diagnosis when immunocytochemistry is not available. Idiopathic pericardial effusion comprises 20%–32% of cases, most of which are reactive or chronic inflammatory. The identification of morphology of malignant cells and their arrangement helps in correct diagnosis. Cytological examination of pericardial fluid helps in diagnosis of underlying malignancy and plays an important role in staging, prognosis, and planning treatment for the patients. Benign pericardial effusion was noted in younger age group when compared with malignant effusion, which was seen in older age group. In 20% of cases, the diagnosis was malignant effusion. Adenocarcinoma was most common of all the malignant effusions. The results of pericardial effusion help in upstaging or downstaging of the tumor which affects the treatment plan and prognosis for the patient. Tsang TS, Enriquez-Sarano M, Freeman WK, Barnes ME, Sinak LJ, Gersh BJ, et al. Consecutive 1127 therapeutic echocardiographically guided pericardiocenteses: Clinical profile, practice patterns, and outcomes spanning 21 years. Mayo Clin Proc 2002;77:429-36. Posner MR, Cohen GI, Skarin AT. Pericardial disease in patients with cancer. The differentiation of malignant from idiopathic and radiation-induced pericarditis. Am J Med 1981;71:407-13. Wiener HG, Kristensen IB, Haubek A, Kristensen B, Baandrup U. The diagnostic value of pericardial cytology. An analysis of 95 cases. Acta Cytol 1991;35:149-53. Reyes CV, Strinden C, Banerji M. The role of cytology in neoplastic cardiac tamponade. Acta Cytol 1982;26:299-302. Edoute Y, Malberger E, Kuten A, Ben-Haim SA, Moscovitz M. Cytologic analysis of pericardial effusion complicating extracardiac malignancy. Am J Cardiol 1992;69:568-71. Yazdi HM, Hajdu SI, Melamed MR. Cytopathology of pericardial effusions. Acta Cytol 1980;24:401-12. Krikorian JG, Hancock EW. Pericardiocentesis. Am J Med 1978;65:808-14. Sherwani R, Akhtar K, Naqvi AH, Akhtar S, Abrani A, Bhargava R. Diagnostic and prognostic significance of cytology in effusions. J Cytol 2005;22:73-7. Hathila RN, Dudhat RB, Saini PK, Italiya SL, Kaptan KR, Shah MB. Diagnostic importance of serous fluid examination for detection of various pathological conditions – A study of 355 cases. Int J Med Sci Public Health 2013;2:975-9. Petcu DP, Petcu C, Popescu CF, Bătăiosu C, Alexandru D. Clinical and cytological correlations in pericardial effusions with cardiac tamponade. Rom J Morphol Embryol 2009;50:251-6. Meyers DG, Meyers RE, Prendergast TW. The usefulness of diagnostic tests on pericardial fluid. Chest 1997;111:1213-21. Cheema MA, Ghalib MB, Shatoor AS, Suliman FA, Al-Horub SS, Kardash M, et al. Pattern of pericardial disease in the Asir region of Saudi Arabia. Ann Saudi Med 1999;19:171-3. Fiocco M, Krasna MJ. The management of malignant pleural and pericardial effusions. Hematol Oncol Clin North Am 1997;11:253-65. 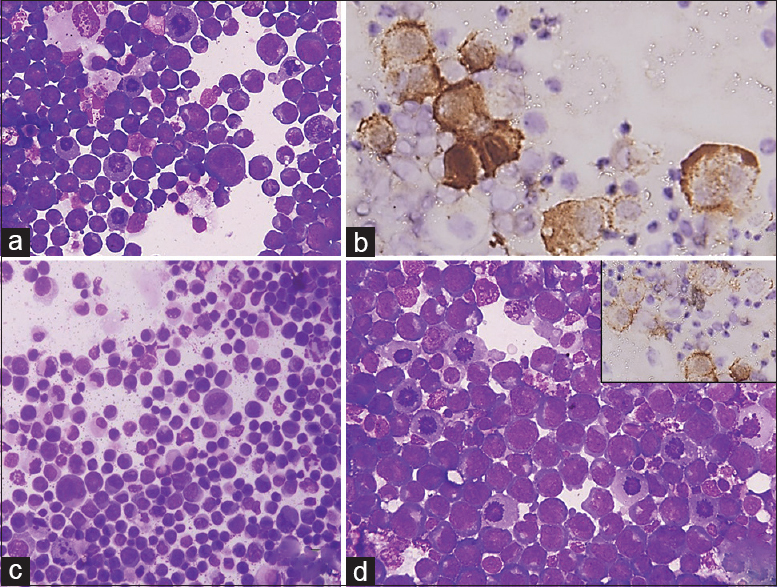 Dragoescu EA, Liu L. Pericardial fluid cytology: An analysis of 128 specimens over a 6-year period. Cancer Cytopathol 2013;121:242-51. Seferović PM, Ristić AD, Maksimović R, Tatić V, Ostojić M, Kanjuh V, et al. Diagnostic value of pericardial biopsy: Improvement with extensive sampling enabled by pericardioscopy. Circulation 2003;107:978-83.